Byford has committed to doubling the pace of elevator installation. Advocates want that codified in an enforceable court agreement. Only 24 percent of subway stations are accessible for people who can’t use stairs or escalators. And less than half of the neighborhoods served by the subway have at least one elevator-accessible station, according to a new report from Comptroller Scott Stringer. That’s on a good day. Elevator outages and malfunctions are commonplace, making even the accessible parts of the system haphazard and unreliable. What might be a 10-minute subway trip for most New Yorkers can take three hours for people with mobility impairments, Monica Bartley, an organizer with the Center for Independence of the Disabled NY, told the audience at a TransitCenter panel last night. Multiple trains and many hours later, Bartley was back in the Financial District at Fulton Street. She ended up taking the bus to Union Square. “Whenever we plan to travel, we always have to plan for a lot more time than it would take someone normally to travel around the city,” she said. Improving accessibility is one of the four topline priorities in Byford’s subway action plan, released in May. 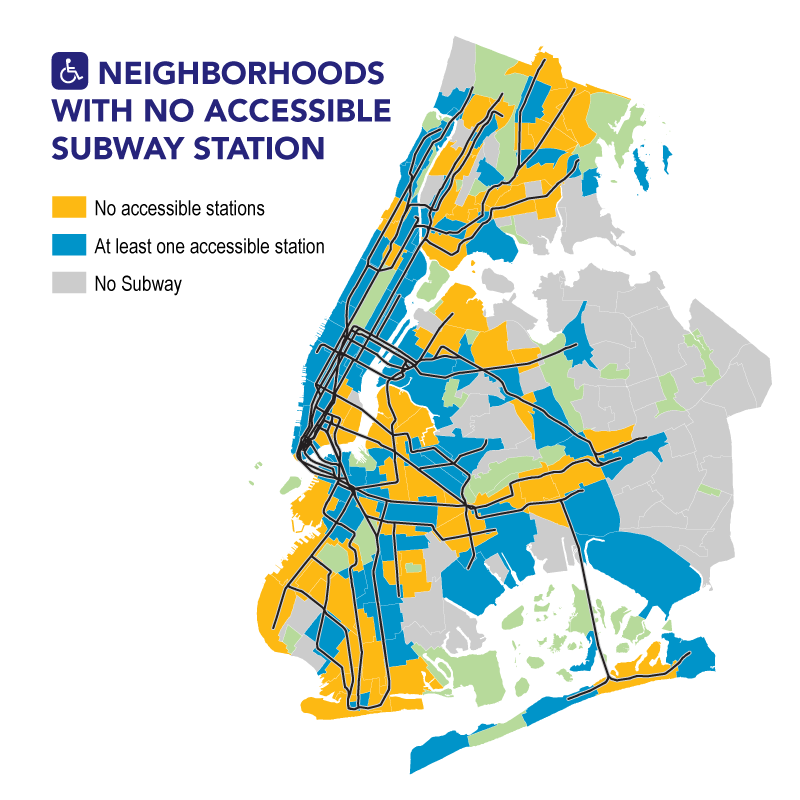 Over the next five years, the MTA plans to make 50 more stations accessible, so that wheelchair users are never more than two stops away from a station with an elevator. Byford has hired former TLC accessibility program manager Alex Elegudin to steer the agency’s accessibility mission. In addition to retrofitting stations with elevators, Byford’s accessibility priorities reflect TransitCenter’s #AccessDenied campaign: hiring staff with first-hand experience of the subway’s accessibility shortcomings, improving the reliability of elevators, and a “streamlined” design-build approach to elevator installation. Panelists pointed out that accessibility doesn’t end with elevators. The width of platforms, the gap between platforms and trains, bus stop snow removal, and the clarity of audio and visual service announcements are all daily concerns for subway riders with disabilities. Bartley and other disability advocates in the room applauded Byford’s commitment to accessibility, but they challenged him to codify it legally. Nearly three decades after the passage of the Americans with Disabilities Act, the MTA has dragged its feet compared to peers in Boston and Chicago, where about 70 percent of stations are accessible and the number is rising. The MTA is currently in the process of settling a class-action lawsuit filed by the organization Disability Rights Advocates related to recent station renovations that did not include accessibility upgrades. The platforms are a problem too. I had to help a woman on one of those disability scooters get onto the platform a few weeks ago. When the doors opened, she drove from the car right into a wall of the platform staircase, and couldn’t make the turn on the narrow space between the gap and the wall. I had to lift her scooter’s front wheel and turn her, but she couldn’t communicate with me and I was worried that I might injure her. Also, I was terrified the train doors would close on her. As platforms won’t be widened anytime soon, some effort should be made to show riders like her which car doors to use for such scooters at particular stations. I know in Japan, there is information at each station as to best cars for getting on to reach certain destinations. We should be able to do this in the NY subway. The problem here is that retrofitting the subway is impossible. Not difficult; not expensive. Impossible. Everyone needs to accept that. The service that is meant to fulfill the needs that the subway cannot fulfill, Access-a-Ride, has proven to be a total fiasco. It doesn’t serve the transportation needs of New Yorkers with disabilities, as it is just as likely leaves someone stranded as it is to show up. And it costs a bundle while not serving those needs. On top of that, it allows the deranged maniacs who operate its vehicles to terrorise other road users with their dangerous driving. The best solution would be to forget about both subway accessibility and paratransit, and to offer full reimbursement for taxi trips to any New Yorker with a disability that prevents that person from using stairs. A traveller could call any livery cab company, all of which have vans that can accommodate wheelchairs. This would meet travellers’ needs at a fraction of the cost of Access-a-Ride. For mobility-impaired New Yorkers, riding the subway can be impossible. Only 110 of the system's 472 stations have stair-free access, and even at those stations, elevators don't serve every platform and are often out of commission, with little or no public notice. New MTA chair Joe Lhota is promising a public-facing dashboard that functions as a "report card" on the agency's performance. Here's what would make it a useful tool to improve accountability and build trust with riders. Starting Wednesday, transit riders will be able to see for themselves how their subway lines are performing, when the MTA launches an online dashboard showing how much time riders lose due to trains that are off-schedule.